“If fault were to be found with the 47th annual gala of the Glasgow Police Club, held at Ibrox on Saturday afternoon, that would not be on the score of the quality of the athletic fare provided. Competition was keen throughout and performances were up to the excellent level expected. But is it not time that the organisers gave some thought to the size of their programme? Five crowded hours of athletics can be a trial even to the most enthusiastic, and while sympathising with the aim of the promoters in seeking to cater for as wide an athletic field as possible, it looks as if a little judicious trimming to bring the programme to normal limits will have to be undertaken in the near future. Coming as it does on the eve of the Scottish Championships, this meeting of the Police has an interest of its own. “In the first class mile, WH Calderwood served up quite a good display, although neither he nor WJ Gunn was concerned in the finish. The race was won by J MItchell of Shettleston in 4 min 22 4-5th secs, but Calderwood, in addition to defeating Gunn, was quite well placed in the time for the complete run out of 4 min 22 sec. The Mile Champion has evidently found his form in good time, for both last Saturday and this he has given good evidence of much better running than he did in the early part of the season when he appeared sluggish and stale. How big was the programme that gave rise to the comments about its length? Well, the confined events were 100 yards (girls, boys and senior men), 220 yards, 880 yards and Mile. The open events were 100 yards (youths), 100 yards (men), 220 yards, 880 yards, one mile (first class), one mile (second class), high jump, one mile relay invitation. Women’s events were 100 yards 880 yards relay. 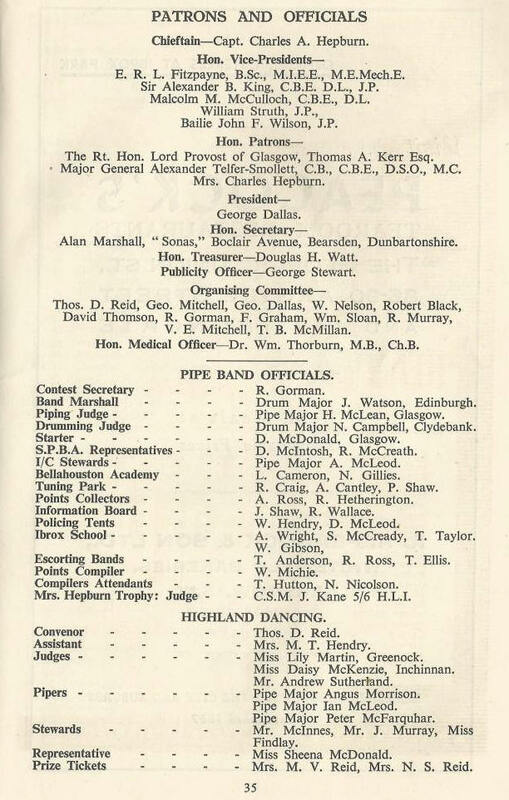 Then there was the 880y relay schools, putting the weight, putting the 56 lb weight, throwing the discus, tossing the caber, wrestling, highland dancing and cycling. Maybe he had something to complain about! The report went on to describe the sprints up to the quarter-mile and the relay although all events seemed to be well supported by good quality Scottish runners. The principal running results were as follows. 440 yards (Invitation): 1. R Hamilton (Maryhill Harriers) 5 yards; 2. LT Montgomerie (Springburn Harriers) 13 yards; 3. JC Scott (Springburn Harriers) 11 yards. Time: 51 1-5th sec. The high jump was won with a height of 5’9.5″ by Sgt E Carey of the HLI and A Nicholson of Glasgow Police won the Open Pitting the Weight and Putting the 56lb weight. “ATHLETICS. Record Relay Race. Glasgow Students success at Police Sports. If it were for nothing else than the fact that it provided the finest relay race seen in Scotland for many years, the Glasgow Police meeting, held at Ibrox Park on Saturday afternoon, must go down as one of the most successful in the long series extending back almost half a century. Promoters of a meeting such as that on Saturday are always handicapped by the size of the programme, and that it was brought successfully to a close within reasonable time reflects great credit on the organisation. With the track in excellent condition, and atmospheric conditions propitious, times ruled fast, and there were many fine performances recorded, not only by the leading runners but also by the handicap men. NEW NATIVE RECORD. It is a coincidence that the existing native relay record of 3 mins 37 sec was made by the Edinburgh University team at the same meeting three years ago and that the figures should have been set up at the Police meeting again, and also by a students’ team, this time from Glasgow. 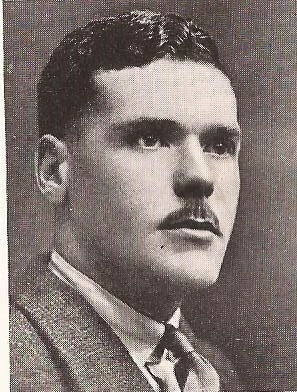 There was some criticism on the last occasion on admitting the Edinburgh performance as a national record because of the fact the RL Howland, an Englishman, was a member of the team. There can be none this time, as M Morrison, M Stone, R Murdoch and IE Dorland are all Scottish born. After the opening half-mile sector of the race a new record was always in prospect and it was no surprise when the time, 3 mins 34 3-5ths, 2 2-5th faster than the old time was announced. This represented excellent running on the part of all four students, and all four Maryhill men, as the national champions finished only inches behind the winners and well inside the record also. Figures on the record book, they say, are there for all to see, but what will matter to Saturday’s twenty odd thousand spectators is not so much the time, excellent though it was, but the memory of a magnificent race by both teams redolent of the highest courage. So evenly were both teams matched that the decision was in doubt from the time the half-milers started racing seriously, three hundred yards from the first change-over, until the tape was broken. Where all did well it is possibly ungenerous to to select individuals for special mention, but it is an undoubted fact that the two men who contributed most to the excellence of the race as a spectacle were Neil Morison in the half-mile and FW Brown in the quarter. Morison has been well known as a miler for the past few seasons and has recorded many good performances over that distance, but few, even among his Westerlands admirers, realised that he could get the half-mile under even time as he did on Saturday. Nor was it expected that Brown, chiefly regarded as a sprinter, could concede Ian Borland three yards over the quarter and come close to springing the surprise of the season. Yet both things happened with the result that the race was intensely exciting. POINTERS FOR HAMPDEN. The race itself threw some light on the problems to be solved next week-end, particularly in the half-mile which is the most open race on the championship programme. On his showing in Saturday’s race and his indifferent form during the present season, James Hood, the reigning champion, is not likely to repeat his victory, but JC Scott of Springburn, WH Calderwood of Maryhill and N Morison if he can reproduce the same form, are distinct possibilities. JC Scott has made a rapid advance during the season. He ran a very strong race on Saturday and, although beaten by both Calderwood and Morison, it must be recollected that earlier in the afternoon he had won the Police half-mile in 1 min 59 1-5th sec. Calderwood finished as strongly as he always does that he too must possess a decent chance. Robin Murdoch and AD Turner met in the third sector and the champion getting away three yards clear of the Maryhill man and at the final change-over he had retained his lead and even slightly added to it. Murdoch was moving better than he has done this season but Turner was somewhat disappointing and it was evident that the break in his training caused by his leg injury has taken some of the fire out of him. The next week should see him better tuned up, though under the circumstances, his trainer expressed himself as satisfied. Relay result: 1. Glasgow University (N Morison, N Stone, R Murdoch, IH Borland); 2. Maryhill Harriers (WH Calderwood, D McBride (? ), AD Turner, FW Brown). The 1933 Games were almost a replay of the headlines for the meeting. “Exciting Relay At Police Meeting” topped the article and a sub-head halfway down read “A Championship Pointer”. The relay was just as exciting but the result was different – Glasgow Police won from Glasgow University with Maryhill Harriers third – although many of the personnel were the same. The big race of the meeting however was an invitation mile with all the best men in the country invited. Although there was one withdrawal on the day, the star miler of the thirties, the man with the charisma and talent to match, Tom Riddell did appear in what was a good race. “The Glasgow Police Club have a public all their own and it was not surprising to find their annual meeting, the 52nd of the series, attracted the best attendance of the season to Ibrox Park on Saturday afternoon. Because of their particular place in the realm of Scottish athletics, the Glasgow club are committed to a programme which because of its variety is always colourful, but one is tempted to think that because of this same variety the purely athletic side is apt to be submerged. TM Riddell was the outstanding competitor, and the Scottish champion chose to run in the ordinary mile handicap instead of a small selected field. This was reminiscent of old times, when the reigning Scottish champion made a practice of it, but it was obvious on Saturday that Riddell, with over 100 runners in front of him, had set himself a hard task. This was not so apparent in the first two laps, but in the third when he began to pick up his men he was compelled to chop his stride repeatedly in threading his way through with the result that his pace was slowed down. He was 50 yards behind the leaders at the bell, and although he made ground over the last quarter, was 30 yards behind when the winner broke the tape. Riddell’s lap times were 60 5-10th, 66, 70 and 66 1-10th sec. H Haughie of Springburn Harriers, who won the race off 140 yards in 4 mins 18 4-10th sec, has been competing at open meetings for nine seasons yet this represented his first prize in open handicaps. The runner-up, JL Ferguson of Motherwell YMCA, is having a good season this being the sixth time he has been in the prize-list. The remainder of the report was given over to cycling and wrestling but the results show that there were 16 track and field events from 100 yards to the mile. With 20,000 spectators it did indeed have a special place in the calendar as far as spectators were concerned and the comment that Tom Riddell lined up behind over 100 runners shows that it was popular with the athletes as well. It was probably used as a tune-up for the SAAA championships which always came a week later, but any similarity between charging through such a big field on a track churned up by previous races as well as the field in the mile and the smaller field on the better track of the championships, must have been slight. The quality of the relay in 1935 may have been criticised by the Press but there was no doubt about the standard in 1936 when Bellahouston Harriers not only defeated all the previous star teams – Glasgow Police, Glasgow University, Maryhill Harriers – but set a record for the event. The short report read: “ATHLETIC MEETINGS. POLICE SPORTS. Bellahouston Record In Mile Relay. Although only one record was broken in the huge programme carried through by the Glasgow Police at Ibrox on Saturday, the crowd evidently enjoyed every minute of its four hours duration. There was one performance of the gathering demanding minute attention, and that was the win of Bellahouston Harriers in the one mile invitation medley relay race which they won in the new Scottish record time of 3 mins 34 2-10th sec, 2-10th sec faster than the time put up by Glasgow University at the same sports four years ago. It was the half-miler Jack Gifford who really did much to help Bellahouston achieve this performance. He went round the half-mile at the heels of Robert Graham, always appearing to have an abundance of pace, while it seemed that the joint mile record-holder (whose record was broken by SC Wooderson in Saturday’s Southern Championships) never relished the forcing tactics of the erect running style of Gifford. Coming into the straight Graham was in front trying hard to get rid of Gifford but the latter refused to be shaken off and became the challenger in chief, with the result that Bellahouston enjoyed the slight advantage of a change-over so close was the struggle; and the time for the half-mile was 1 min 58 2-10th sec, a sign of a record in the making. Sprinter G Young and J Bone carried on the good work for Bellahouston and when Charlie France got the baton for the quarter-mile the race was virtually over, although Maryhill Harriers were putting up as big a fight as possible against the odds. Had France been compelled to race with more vigour there would have been a bigger cut on the previous figures for the distance. 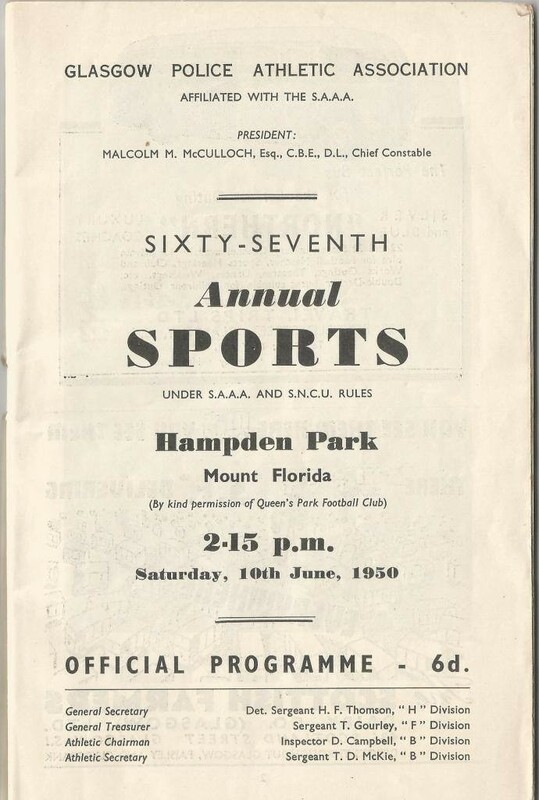 The programme contained one invitation event, ten open track and field events, three confined (to policemen) events, two wrestling bouts, two tug-o’war competitions, two cycle races, and a five-a-side competition in which a Rangers team made up of Meiklejohn, McAulay, Venters, Turnbull and Stewart, lost 1-0 to a Celtic team of Hogg, Morrison, Buchan, Fagan and Fitzsimons. The other teams were Clyde and Partick Thistle. Five sports over four hours – quite an afternoon! In 1937 JL Law of Shawfield Harriers won both sprints in good time: the 100 yards in 9.6 sec and 220 yards in 21.9 secs – and quite comfortably No stars in the competition, the attraction was the invitation to Salford Harriers to enter a team for the medley relay in which they had to concede 20 yards to the Scottish teams. They won anyway with their opening runner catching all the Scots except Robert Graham who only beat him to the change-over by a single yard. There were not other outstanding performances unless Andy Forbes.of Victoria Park winning the Mile off 160 yards in 4:14 is seen as the start of his subsequent glorious career over longer distances. In 1938 one of the highlights was Bellahouston Harriers winning the relay – which was by now the official SAAA Championship – for the third successive year in a new record time of 3:32.9. Other stand-out items were the fast sprinting, Bilsland’s victory in the half-mile but the complaints about the length of the meeting re-surfaced when the event, which had started at 2:00 pm, did not finish until 7:00 pm. There was included in the programme a demonstration of sheep-dog trials was added. In the relay, GM Carstairs made the early running in the 880 sector but was overtaken in the finishing straight by Gifford of Bellahouston. 1939 might be seen as the first of the big Police Sports Meetings that would carry on after the war. Unusually, it was held at Hampden and not at Ibrox. There were AAA champions, Norwegians in the field events, a great win by Donald Robertson in the road race and controversy in some of the finishes. No sheep dogs anywhere to be seen though. The report is fairly lengthy and only extracts will be reproduced. “In spectacular interest two events stood out in the splendid sports programme carried through at Hampden Park on Saturday. They were the invitation half-mile which provided many thrills in its closing stages, and the road race from Kilmarnock to Glasgow won by Donald Robertson of Maryhill Harriers, the noted marathon runner. In the half-mile JRS Robertson (Shettleston Harriers) made full use of his 33 yards allowance to lead the field right into the finishing straight, but he weakened at that crucial stage and a group of prominent back-markers then figured in a stirring struggle. AJ Collyer, the AAA’s champion (scr), and R Graham, the Scottish mile champion (15 yards), took up the running, with RTH Littlejohns, the Scottish half-mile champion, about seven yards behind. One hundred yards from the tape Littlejohns commenced the devastating finishing burst for which he is noted, and brought the spectators to a high pitch of excitement as he speedily closed the gap. Forty yards from the tape he passed Graham, ten yards farther and he was ahead of Collyer. It seemed certain that Littlejohns would win, buit the British champion rallied superbly, challenged strongly, and when Littlejohns faltered just at the tape, Collyer made his last bid winning by the most slender of margins in literally the last stride of the race. In such windy conditions the time of 1:56.3 was commendable.